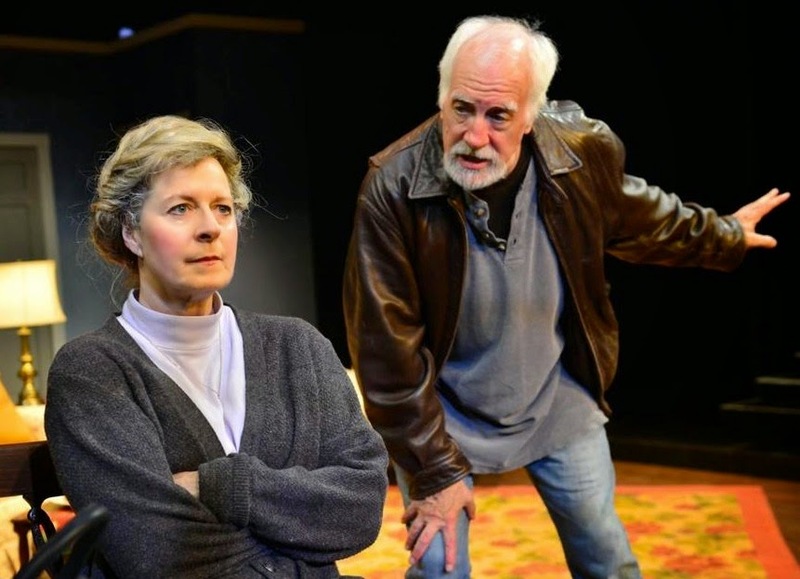 The widow and the wiseguy at Gloucester Stage. Photo: Gary Ng. As a theatergoer, you may (or may not) be glad to know that - and of course "lives" may not be quite the verb I'm looking for in the case of Jack Neary's Auld Lang Syne, whose modest charms are currently spacing out the more ambitious productions at Gloucester Stage. Maybe "Summer stock is still mildly entertaining!" or "Summer stock is still a pretty good way to while away two hours on a hot night as long as there's air conditioning!" might be better opening salvos for this review. Still, I have seen weaker new plays than Auld Lang Syne - its author has a talent for badinage, at least - although it must be said the value of this stock issue largely derives from its two stars, much-loved local acting couple Paula Plum and Richard Snee, who sell the rather predictable twists of Neary's plot with sure, subtle skill (and even swing his abrupt shifts in tone). Plum is the mousy widow from Southie who longs to join her departed husband in the hereafter; Snee is the wannabe wiseguy she hopes will help her on her way. She's a good Catholic, you see, so suicide is taboo - but she doesn't want anybody to kill her while he's mad at her, either; meanwhile the hired hand, though he's been rehearsing for a whack job all his life, has some doubts about whacking someone quite this wacky, oh and another thing . . .
You get the picture. It goes without saying that summer stock is long on exposition and short on development, but Neary pushes the envelope of dramatic delay so far that he all but tears it open; in fact we're almost an hour in before we get to anything like rising action - and then it's only a slight upward grade. Still, the bright side of that strategy is that he only has to write half a play - and the upside for you is that you can come in late without missing anything. In fact my advice is aim for intermission, because things do improve in the second half, when Neary finally gets around to his actual exposition. Alas, we never reach anything like development, which is too bad, because the play's premise is a bit better than a mere gimmick; indeed, I kept thinking that if only the playwright had watched Plum and Snee in action, he might have been tempted to write them better lines! But Neary never explores the parallel ironies of these two basically wasted lives: the widow and the wiseguy (now there's a title for you) never achieve any new level of self-awareness, and they don't even build a real relationship (although Plum and Snee, through pure sleight-of-hand, may make you half-believe they do). And in a two-hander, those are basically your only options. Oh, well. I must also report, however, that despite the script's shortcomings, many in the opening night audience at Gloucester were not displeased as the curtain fell. But I suppose it helped that the show was sprinkled with catnip for a Boston crowd of a certain age (if you remember Edith Bunker, and thought Nunsense rocked, you'll love this), and Plum and Snee do keep the ping-pong ball of the dialogue bopping lightly through the air. And under the capable direction of Doug Lockwood, both sketch in the backgrounds of their characters' journeys as well, even if this dramatic vehicle is basically stalled; Snee may have been the more compelling in this regard, although perhaps we've simply seen Plum go down this road too many times before. But then even a well-traveled path can be welcome if the destination is worthy. Maybe next time this playwright will provide one.